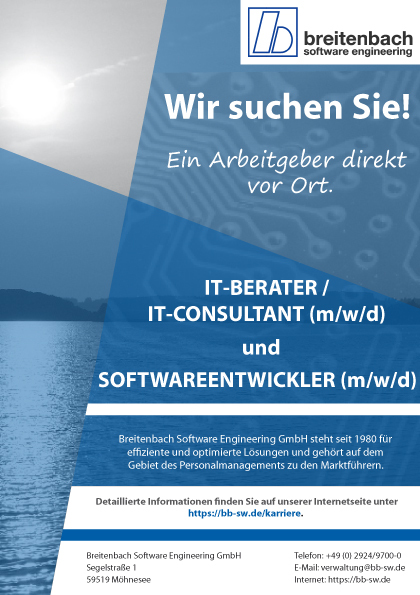 We’re looking: IT Consultant (m/f/d) and Software Developer (m/f/d) to strengthen our team at Lake Möhnesee, in Fürth and in Tiefenbach. Find out more about our vacancies on our website (https://bb-sw.de/karriere). Furthermore, we would like to meet you at the career day of the University of Applied Sciences Südwestfalen (Campus Soest; building 10, booth 101; Lübecker Ring 2; 59494 Soest) on the 10th of April 2019 from 10:00 – 16:00 o’clock. If you are interested, you are welcome to send us your application. Please send us your complete application documents by e-mail to verwaltung@bb-sw.de or by post to Breitenbach Software Engineering GmbH, Segelstraße 1, 59519 Möhnesee-Delecke. In addition you have the possibility to apply via our online application management. Of course we will treat your application as absolutely confidential. We are looking forward to an interview with you!